A sample of the mineral perovskite is shown in the foreground, while behind it is an image the researchers used to prove the effects of intense light on a thin film of perovskite. Fluorescence imaging shows that areas receiving more light became more purified, as revealed by brighter fluorescence from those regions. Image: MIT News; fluorescence image courtesy of the researchers. 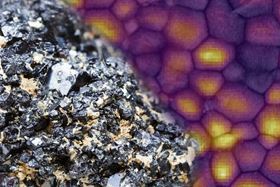 A family of compounds known as perovskites, which can be made into thin films with many promising electronic and optical properties, has been a hot research topic in recent years. But although these materials could potentially be highly useful in applications like solar cells, some limitations still hamper their efficiency and consistency. Now, a team of researchers at Massachusetts Institute of Technology (MIT) and elsewhere say they have made significant inroads toward understanding a process for improving perovskites' performance, by modifying the material using intense light. The new findings are reported in a paper in Nature Communications, with this work forming part of a major research effort on perovskite materials being led by Samuel Stranks, a researcher within MIT's Organic and Nanostructured Electronics Laboratory. In this study, Stranks and his colleagues focused on a specific type of perovskite material known as organic-inorganic metal halide perovskites, which are considered promising for applications such as solar cells, light-emitting diodes (LEDs), lasers and light detectors. They excel in a property called the photoluminescence quantum efficiency, which is key to maximizing the efficiency of solar cells. But in practice, the performance of different batches of these materials, or even different regions on the same film, has been highly variable and unpredictable. This is because tiny defects in perovskite's crystalline structure can hamper the conversion of light into electricity, but "what we're finding is that there are some defects that can be healed under light," says Stranks, who is a Marie Curie Fellow jointly at MIT and Cambridge University in the UK. The tiny defects, called traps, can cause electrons to recombine with atoms before they are able to reach a place in the crystal where their motion can be harnessed. The researchers found that intense illumination caused iodide ions in the perovskite film to migrate away from the illuminated region, and these migrating ions apparently swept away most of the defects in that region along with them. "This is the first time this has been shown," Stranks says, "where just under illumination, where no [electric or magnetic] field has been applied, we see this ion migration that helps to clean the film. It reduces the defect density." While the effect had been observed before, this work is the first to show that the improvement was caused by the ions moving as a result of the illumination. Previous work on reducing defects in thin-film perovskite materials has focused on electrical or chemical treatments, but "we find we can do the same with light," Stranks says. One advantage of this is that the same technique used to improve the material's properties can at the same time be used as a sensitive probe to observe and better understand the behavior of these promising materials. Another advantage of this light-based processing is it doesn't require anything to come into physical contact with the film being treated – for example, there is no need to attach electrical contacts or to bathe the material in a chemical solution. Instead, the treatment can simply be applied by turning on the source of illumination. The process, which they call photo-induced cleaning, could be "a way forward" for the development of useful perovskite-based devices, Stranks says: "The ultimate aim is to make defect-free films." The resulting improvements in efficiency could also be useful for applications in light emission as well as light capture. The effects of the illumination tend to diminish over time, admits Stranks, so "the challenge now is to maintain the effect" long enough to make it practical. Some forms of perovskites are already "looking to be commercialized by next year," he says, and this research "raises questions that need to be addressed, but it also shows there are ways to address" the phenomena that have been limiting this material's performance. This work also follows the recent discovery that certain defects in perovskite solar cells can be healed by placing them in the dark (see Perovskite solar cells benefit from a few minutes in the dark). By using novel branched ligands, scientists have produced perovskite nanocrystals with greatly improved stability and uniform particle size.